Most stations are beginning to make progress toward engaging communities, but more effort is needed to ensure community input informs programming. Stations made moderate to high progress in building and sustaining partnerships. Stations and partners rate their relationships highly and recognize the mutual benefits of working together. Stations identified several needs to make further progress: infrastructure such as contact stations, signage, restrooms and parking; training, including in customer service and audience research; and improved external communication such as better websites and multilingual communications. See the 2018 Urban Wildlife Conservation Program Report or view the NCTC broadcast. New study finds that bird species that call during migration flights seem to be more susceptible to collisions with buildings, drawing more individuals in towards the lights. So these species end up with a potentially similar ‘drawn in’ effect –like bats with turbines–emphasizing the importance of Lights Out programs. … See the rest of this article here. The Intertwine Alliance and the U.S. Fish & Wildlife Service are proud to announce the release of Northwest Family Daycation – just in time for your spring break fun! Daycation is a completely free mobile app for families with young children that takes all the planning and guesswork out of exploring nature in the Portland region. Our team of parents and nature enthusiasts have curated fun adventures all over town that connect natural areas to other community amenities, all while considering the needs of young explorers and their caregivers. This version 2 release of Daycation features major design and functionality improvements based on user feedback. A big thank you to everyone who has been involved with the app’s development over the past few years by creating Daycations or downloading the product. We hope you’ll check out v2 on Apple and Android phones – and let us know what you think! Our team will release a new Daycation each week. Intertwine partners and friends, we invite you to keep submitting adventures featuring your favorite places. WHEN: A training webinar for Urban Evaluation Phase One of the Priority 14 Urban Wildlife Refuges will be held on February 7, 2017. WHAT: Planning and Partners Assessment forms, in a fillable format, will be distributed during the webinar. OTHER INFO and IMPORTANT DATES: The deadline for the 14 Priority Refuges to complete assessments has moved to August 15, 2017. A formal invitation with login instructions will be forwarded soon. Please inform others, or share this calendar invitation, to any other interested parties. Other interested refuges may join the webinar for information, but it is not required. Our first two Urban Priority Refuges that received an additional $1M in base funding have released impact reports. Both reports highlight accomplishments and measurable results. Link to the SoCal report. Link to the Portland-Vancouver report. UWRP and UBT Grant Process Webinar: Recorded on Wednesday, November 30, 2016, this webinar provides a general update on the Urban Wildlife Conservation Program, as well as information about the National Fish and Wildlife Foundation (NFWF) Five Star and Urban Waters Restoration Grant Program. Urban Wildlife Conservation Program Webinar : This webinar recording is from Thursday, December 10th and provides a general update on the Urban Wildlife Conservation Program, as well as more information about the National Fish & Wildlife Foundation Five Star and Urban Waters Restoration Grant Program. American society is more ethnically and socially diverse than any other time in history. We are becoming more urbanized and studies show that people are spending less and less time outdoors. Offering a 24,000-acre living laboratory, Bayou Sauvage is an outdoor recreation and wildlife gem in one of the country’s most vibrant urban centers. The U.S. Fish and Wildlife Service’s Urban Wildlife Conservation Program got a big boost last week in Colorado as two new videos about urban outreach in Southern California debuted at the Telluride Photo Festival. The city of Springfield, Massachusetts has been recognized by the federal government for environmental stewardship. With the designation comes some money for a project to restore an urban conservation area. The U.S. Fish and Wildlife Service Monday designated the Springfield Urban Wildlife Refuge Partnership. It is a cooperative effort to promote conservation values with urban residents, especially young people, according to Deborah Rocque, the northeast deputy regional director for the wildlife service. 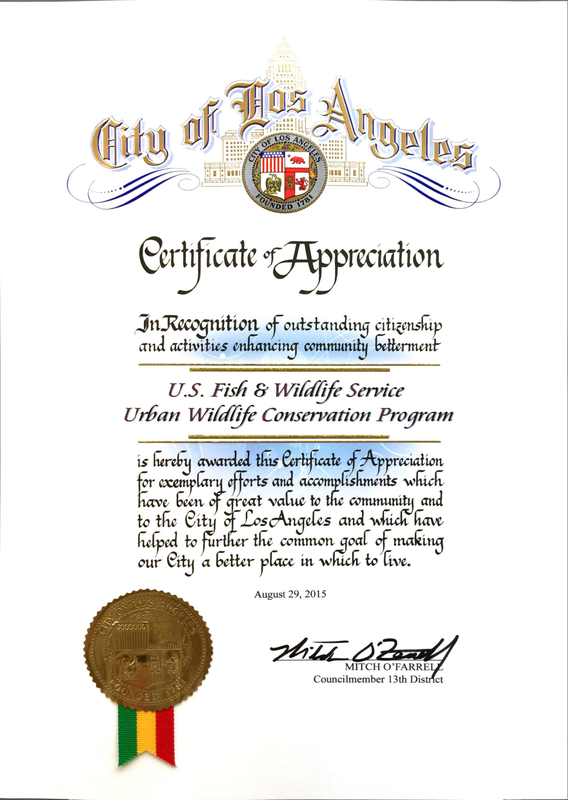 Very neat recognition of the Urban Wildlife Conservation Program! Just two weeks into a new school year, Principal John Wilber welcomed a crowd of more than 300 children, parents and community members to Mountain Vista Elementary School in the small foothill town of Fillmore, California. Learn more. Groups involved in creating a new place for watching birds along the Detroit River said Wednesday that they hope it will help reconnect people with the waterway and inspire a new generation of conservationists. A hearing examiner has rejected a developer’s plan to build 30 houses and a bridge over Ebright Creek in Sammamish, one of the primary spawning streams for kokanee salmon in the Lake Sammamish basin. HADLEY – One 13-year-old girl said if she saw a snake she would run. Another gladly reached out her hands to hold a toad. They were among the dozen girls in their first year in the Girls Inc. Eureka! program learning about nature at the Silvio O. Conte National Fish and Wildlife Refuge at Fort River Thursday. Connect with us and learn more about the Urban Wildlife Conservation Program.